Every couple of months or so, I like to spend some time with my sister Margaret. She lives in North Carolina, about a four hour drive from me, so when both our schedules allow, I try to head south whenever I can, to visit her in her yellow house among the pines. The fact that she’d recently painted the house yellow (with red trim) was the first surprise she had for me. Margaret is the sixth child in our family lineup of seven (I’m fourth). Growing up in a brood that large, one is inclined to be surprising simply to get attention; Margaret, perversely, is surprising without intending to be. She has always done pretty much what she wanted to, regardless of what anyone thinks would be better for her. For example, Margaret is just under six feet tall and rail-thin – so what sport does she play? 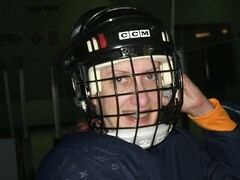 I hadn’t seen Margaret skate since she first started dabbling in hockey years ago, when she was living in Brooklyn. She started off with the Brooklyn Blades, a women’s recreational team; now that she’s in Raleigh, she plays with the Trailblazers’ “D” team. They’re a nice group of women (we went out for beers after the practice), but most of them are built along the standard hockey player mold – short and compact. Seeing Margaret skating amongst them is like watching a giraffe that somehow got mixed up in a herd of wildebeest. Her skating style is upright and rather graceful (she says, “no, I’m just slow” – although she’s gotten a lot faster since her Blades days). After the practice and the beers, we got home around 1 a.m. and were greeted joyously by Molly, Margaret’s current dog. 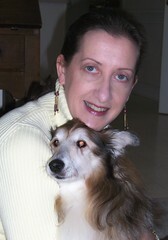 Margaret has owned dogs for years and is partial to Shetland Sheepdogs; Molly is her third “official” Sheltie although she has fostered others through her local Sheltie rescue group. Molly actually started out as one of Margaret’s fosters; Molly’s original owner became too infirm to care for her and gave her up, and Margaret fostered her until she was adopted out. Unfortunately the adoption didn’t “take” – Molly’s new family just didn’t warm to her, and eventually gave her up to the rescue organization again. Margaret took her as a foster again, then decided poor Molly had been through enough and adopted her. Molly is a sweet dog. I first met her last summer, when Margaret, John and I shared a beach house for a long weekend. 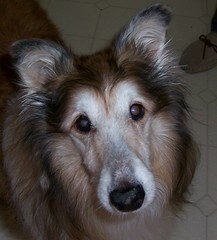 Margaret brought Sam, her second Sheltie, who’d been her loyal companion for some sixteen years (and yes, Sammy was indeed a who and not an it). Molly tagged along, skittish and uncertain of her place in the world. Since last summer, Sammy has passed away (Margaret scattered his ashes on that very beach), and Molly has positively blossomed in Margaret’s care. She follows on Margaret’s heels with the same single-mindedness that Sam had, and while she doesn’t quite have Sam’s sense of humor, she also didn’t have his advantages growing up. She enjoys being petted now, particularly when you rub her around the ears and face, and will burrow her nose behind your knee when you do it. In spite of Molly’s niceness, I was a bit surprised when Margaret adopted her. In Sam’s declining years, Margaret made noises about not getting another dog – she travels a good bit, for work as well as for pleasure, and she can’t always take a dog with her. Every out of town visit either entailed the expense of kennelling her dogs, or finding a friend who could take them while she was out of town. But the image of Margaret without a dog tagging behind her seems incomplete, and she and Molly are a good match. The next day Margaret and I slept in, ate a late breakfast and then tooled around town, making the rounds of the Farmers Market, the local garden shops and a bead emporium. Coupled with hockey, beading seems a peculiarly sedate occupation, but that’s Margaret all over again. She showed me her beading stuff when we got home that afternoon (she made the earrings she’s wearing in this photo), and I was startled to see beads that I recognized in the kit. She said that on her last visit home, Mom had unearthed some the beads from my old kit – I had forgotten that I did beadwork back in college. There’s one large, lumpy terracotta bead that I particularly remembered; Margaret said she was going to find some use for it and I wished her luck – I had never been able to make it work in anything. But knowing Margaret, she’ll find a way. That evening we had dinner out with Emory and Sue, a pair of Margaret’s very good friends. The dinner was hit or miss – we had a charmingly inept waitress and both food and service were spotty – but we had good drinks and a nice time. The next day we rolled out of bed early and went for a long hike around Lake Johnson, then out to the local REI for a birdwatching clinic, then to Whole Foods to pick up some very fine steaks and baby vegetables to have for dinner with the bottle of chianti I’d brought down with me. We finished the chianti, opened some shiraz and eventually retired to the living room, where we slounched on the sofa and talked and looked at photos, talked and teased Molly until she got a little crazy, talked about Margaret’s upcoming trip (she’s heading to Montana to do some trail-clearing at a national park – surprising Margaret again), talked and talked and talked until I couldn’t keep my eyes open and went up to bed. Margaret left for work this morning in a smart brown suit – Margaret the hockey player, Margaret the dog lover, Margaret the beader, Margaret the hiker/camper/mountain woman is also Margaret the journalist. But to me, Margaret is mostly my sister. So very sweet. 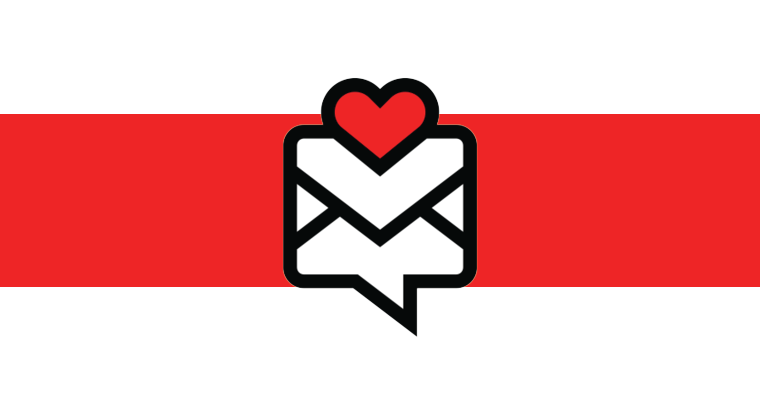 Nice post.I’m glad you are back…I have missed our afternoon chats!Glad you had what sounds to be a fantastic time with Margaret.Nice to have you back! Lucky you indeed! Sounds like you have a great relationship. Raleigh/Durham is an area we are thinking of retiring to, is there any “theatre” going on there? Hi, Jay. I know of the North Carolina Theatre, which does big musicals and frequently hires “names” out of NYC to star in them. I haven’t seen any theatre there but there appears to be a lot of it. There’s some listings at the City of Raleigh webpage at http://www.raleigh-nc.org. Click on “Leisure” on the home page, then “Arts, Attractions and Museums” on the next – you’ll get a sub-menu with “Theatre” that has a pretty comprehensive guide. What a wonderful example of simple, honest, sisterly love. Donna your talents as a writer mirror your talents as an actress. How beautiful and touching. I know I met Margaret at some point, but now I feel as if I know her even better. I marvel at her joy and love for what she does, no matter what. Sitting here in my apt in NY I feel like I was right there with you. Pass the beads!We all have our talents and gifts, and it’s the people in our lives who help us cherish and utilize them. Yup, that’s our Perg. Sounds like you two had a great visit.